Using a flag cross base is a perfect solution for displaying your flag at indoor events. 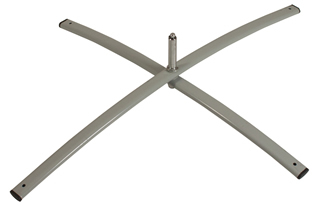 Simply attach your feather flag or teardrop shaped flag pole to our cross shaped base and away you go! To add extra stability for outdoor events, add our flag weighted ring to the cross base and fill it with water. Great for hard flat surfaces. Price includes cross base for use with zip or teardrop flag.